He talks about the definition of music, about the role of music in culture, about the rapid growth of classical music in China today, and about his own Silk Road Project and the concept behind it. In a subtle way, much of the interview is theoretical. When asked about classical music in China, he makes a distinction between the "thrill of the new" and what is actually sustainable going forward. An interesting response. 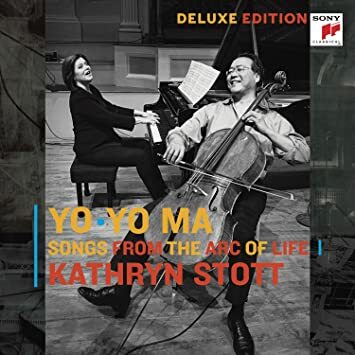 Cellist Yo-Yo Ma and pianist Kathryn Stott create a unique classical music experience with their new Sony Classical recording Songs from the Arc of Life available September 18, 2015. This all-new recording also celebrates thirty years of friendship and collaboration in concerts and recordings for Ma and Stott. The album includes pieces they have frequently performed but never recorded, as well as a handful of discoveries. "I like to think of Songs from the Arc of Life as an invitation to our audience to remember and imagine what the soundtracks of their lives might be," Yo-Yo Ma says. "Kathy and I have talked for years about recording an album of music we absolutely love, pieces that express the context of a life, of our lives. Childhood, adolescence, young adulthood, middle age, old age: what do they sound like?" "I love this title," Stott says, "the 'Arc of Life' because it is one big arc. Once we arrived at the idea, we began to see a beautiful story, a journey through life's experiences. It has taken us a long time and much discussion, back and forth, to discover what that journey might be, because everyone's journey is slightly different." Songs from the Arc of Life begins and ends with two, much-beloved settings of the traditional "Ave Maria," opening with the soaring, radiant Bach/Gounod arrangement and closing with Schubert's more serene, contemplative version. In between is a remarkable spectrum of music that includes such enduring favorites as Brahms' "Lullaby," Dvorak's "Songs My Mother Taught Me," Elgar's "Salut d'amour," Gade's "Jalousie" and Saint-Saens' "The Swan," as well as richly evocative works by Debussy, Delius, Faure, Gershwin, Grieg, Kriesler, Messaien, Schumann, Sibelius and Tchaikovsky. Ma and Stott also include a haunting piece by the contemporary composer Giovanni Sollima, a friend and colleague of both artists. In addition to beginning his fourth decade of collaboration with Stott, Yo-Yo Ma is celebrating a milestone birthday this year. "Turning sixty has me wondering what the future might bring, but also reflecting on what has passed," Ma says. "Kathy and I have known one another since we were in our twenties. We have a shared performing history and thousands of conversations and experiences and we're delighted, through Songs from the Arc of Life, to share them with you." Ma recently performed all six of the Bach cello suites without break at the BBC Proms. There is something about music writing--and writing about a live concert specifically--that brings out the descriptors. I've run into the dilemma myself on this forum. The problem is there is no set of words that will ever take the place of hearing the actual concert, yet at the same time no verbal interpretation can ever really be challanged on a factual basis, since much, if not all, of musical experience is subjective. The result is that music writing may be the one genre today in which ridiculously florid prose is still generally accepted. Somebody should be anthologizing this stuff, raising it to the level of an artform in and of itself . . . This was a first. One cellist, six cello suites, no interval and an audience of 5,000. Yo-Yo Ma, beaming as only he can, reclined back in his chair and looked heavenwards: clearly, for this Bachian odyssey, he’d be travelling Club Class. In fact, there was to be no gilding, no glamour and no grand-standing. Playing on what sounded like gut strings, his tone was tawny, delicate, flecked with frictive texture, as far as possible from the glossy vocalisation we associate with the instrument. For all Ma’s charisma, this was an extraordinary exercise in self-effacement. After hearing close-miked recordings or performances in resonant churches, his famous G major Prelude sounded disconcertingly naked in the Royal Albert Hall, at once vast and claustrophobic in its replete state. Ma’s strategy was to pull the listeners inwards with absolute clarity of articulation - even if it meant tempos were slower - dancing vitality and variety of phrasing, and by releasing rather than forcing the sound. His command of Bach’s language is complete: each dance was delivered in a single, miraculous train of thought; each suite beautifully shaped, the six dramatised into a whole. Curiously, the most intense moment of the first suite came in the second Minuet, nudged into being like a fragment of memory - sad, spectral, a dream-like absorption settled over the audience. As Ma leaned into the suspensions of the darkling D minor Sarabande, one became aware of a conversation between two voices, groping towards the light. Youthful optimism propelled the third Prelude, and he generated a thrilling flood of tone in its mammoth crescendo. The good-natured but ungainly E flat was here stately, its bourrées lit with mischievous charm. The tuned-down C minor Suite plumbs the depths: Ma created an organ-like richness in its Prelude, contrasted by the still, small voice of its Fugue, while the Allemande seemed to float in space, untethered, visionary. Its Sarabande was the emotional heart of the evening: in Ma’s hands, the stark unfolding was swift and quiet, its crisis unresolved, limping to an end of utter desolation. Perhaps it was real exhaustion: the Gigue that followed was heavy-footed, and he’d wrung out his cramped hands before the Suite began. Only after this suite did listeners leave a long silence. A burst of energy brought the D major to sparkling life. Bach’s writing high on the A string here so brilliantly conjures a fresh, silvery, air-borne world. Yet, even here, the Prelude was calm, deliberate, rather than dazzling; the Sarabande boasted no ravishing cascade of chords - rather, they were touched into resonant life with the subtlest of gestures, the pay-off being cheerfully crisp gavottes and a gigue fizzing with humour. At no point did I recognise his previous recordings or performances: this was being created in the moment, for this one occasion. After his standing ovation and numerous returns to the stage, Ma produced the unthinkable: an encore. Casals’s cry for freedom, the heart-breaking El cant dels ocells, soared with almost unbearable poignancy. He dedicated it, pointedly, to all those in ‘need of our help’. Without doubt, we were in the presence of a great musician, and a great man. One to file in the concerts of a lifetime. Arc of Life is mostly what you expect. Most of the tracks are under three minutes and pretty well-trodden. I feel that Stott is a bit of a mismatch throughout the album, but others may disagree with me. Ma’s playing is, as usual, incomparable. There are two tracks on this album that really make it more than just a collection of familiar songs for the broad, mainstream classical listener. The second is an excerpt from Messaien’s Quartet for the End of Time. I saw Ma perform the quartet at the CSO earlier this year. I own a couple of versions of it, but every time the CD ended I would wonder what I missed. I kept waiting for the “quartet” to get going, but of course it never does and that’s the point. The meat of the work is the sections where clarinet, cello and violin, in that sequence, play solo over the piano part. It took the CSO to use changing, colored lights for me to understand this. The excerpt here may serve as a better introduction to the composition than actually hearing it in its entirety. 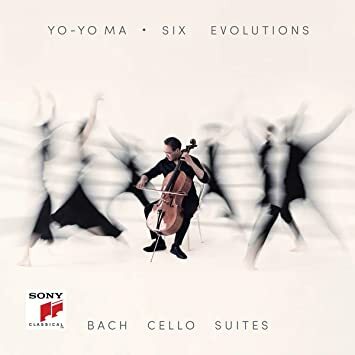 But the real stunner on this album is Ma’s version of a theme from a contemporary Italian film score, by the cellist and composer Giovanni Sollima. Classicaly trained and from a musical family, Sollima is a composer/performer in much the way that popular musicians are, and a cello virtuoso. His compositions have been called “minimalist” or “postminimalist,” and have a tendency to be intensely emotive, something one could argue is lacking in traditional classical performance. He has released several CDs and is amply represented on Youtube. He also worked with Ma’s Silk Road Ensemble at some point. The track is about 7 minutes long. The film that it accompanies is called “Il bell'Antonio,” a remake of a 1960s Marcello Mastroianni film of the same name that is apparently about a man who has a reputation as the ideal lover, but after marrying a beautiful woman begins to have trouble in the bedroom and becomes humiliated. I have not seen either the original or the remake, but based on the soundtrack the man’s problems become a very serious issue. The track begins with a low growl on the cello over a kind of simplified “Raindrop” prelude on piano. The opening melody is a simple, step-wise fragment that seems to contain elements of sadness, indifference, and a deep unsettling anxiety. The fragment develops in an almost intentionally incomplete way to a more openly declamatory resolution, then pulls back and cycles through again. The music pushes farther out with each cycle, until the cello notes begin to slide and distort, the piano part changes to a more urgent arpeggio, and you get a climax of droning, desperate, pleading glissando unisons on the cello—something I didn’t even know was possible on the instrument—which coalesce into a fusillade of tight, slightly off-kilter, fist-shaking chords. There is a short reprise of the main theme and the piece ends quietly. I’m so glad this track made it on the album. The album is worth the money for this track alone. In almost 20 years of attending classical music concerts in Boulder, and after 14 years of writing about these concerts in various forms for the Camera, this writer has never experienced anything quite like the scene at Macky Auditorium on Wednesday night. After it was announced almost a year ago that Yo-Yo Ma — often considered the world's greatest cellist and easily one of the most recognizable names among active classical performers — would headline the 80th anniversary season of the University of Colorado's Artist Series, it didn't take long for Macky to sell out completely, even with elevated ticket prices. Many high-profile artists have failed to sell out the 2000-seat auditorium, a venue whose size is unusual for a city of Boulder's population. Something about Ma is different, and it's not that easy to define. Yes, his artistry is matchless, and yes, he is a tireless ambassador for both music and humanity, but everybody in attendance experienced it simultaneously when he walked onto the stage. Before that, entry to the building was carefully controlled, resulting in the virtually unprecedented spectacle of multiple long lines forming outside the main doors. Even at that moment, it was clear that this would be a concert like no other. Once inside, what the crowd saw was a bare stage with a chair in the center. Ma was presenting a solo concert with no pianist or other collaborators. Even chamber music or solo piano programs are often a dicey proposition in that hall, which is more suited for huge orchestras or opera productions. A single cello would seem dwarfed by those surroundings — but this cello was to be played by Yo-Yo Ma. So came the moment. With his brilliant signature smile, the 61-year-old cellist, whose career now spans around four decades, walked out with his instrument — and the cheers were of a level not often heard even in the most enthusiastic standing ovation after a typical concert. After amiable, ingratiating gestures to the crowd, he sat and played. The word "effortless" is sometimes overused to describe performance styles, but with Ma it is an understatement. On a solo cello recital, it was a given that the bulk of the program would be devoted to J.S. Bach's six suites, and indeed Ma played three of them. The suites have been given in Boulder with some frequency in recent years, including a fine survey of all six by two distinguished Colorado Music Festival orchestral cellists in 2015. But Ma, who has obviously played the works innumerable times over the course of the years, presented the first, fifth and third suites with the seeming ease of an outfielder catching a routine fly ball. Not that this in any way would describe a pedestrian performance. Quite the contrary, Ma obviously deeply feels this music, and it is apparent that it forms a part of his very soul. This was even evident in the way he connected the movements, with just the right amount of bow lift and perfectly timed pauses before resuming with the next dance-style piece in the suite. No emergency tuning here — each suite was a genuinely organic entity. Ma prefaced each suite with a more contemporary piece. The opening number was by the beloved genre-crossing violinist Mark O'Connor. The "Appalachia Waltz" set the scene seamlessly for the first Bach suite. The fifth suite was preceded by a hauntingly beautiful movement from the solo cello partita by 20th century Turkish composer Adnan Saygun. But by far the most substantial and impressive work performed by Ma, even more exciting than the Bach suites, was the 1955 solo cello sonata by revered American composer George Crumb — a composer with longstanding ties to Boulder and CU. This is one of his earliest works. With the third suite, it formed the second part of the program after intermission. The Crumb piece, with its relentless pizzicato and breathtaking buildup, would be a tour de force for any cellist, but again, Ma dashed it off with joyous élan. Following the final gigue of the third Bach suite, the crowd erupted with unrestrained and emotional jubilation. The cellist, still sporting the inimitable smile, came out for several curtain calls, leaving his instrument behind for a few of them. Just when it seemed there would be no encore, there was. After speaking briefly, he played the arrangement by his great predecessor Pablo Casals of the Catalan folk song "Song of the Birds." And then it was over. Macky will return to its usual routine after the exit of this crowd and this artist, but it will probably be another decade or so before the hall experiences anything like this again. Playing catch up again . . . This is not the first time a performer has recorded the same music multiple times. Gould bookended his career with studio recordings of the Goldberg Variations, and put down at least two other versions on tape at various points in his life. Alfred Brendel recorded the entire cycle of Beethoven Sonatas something like five times (I don't remember the exact number, but more than three). I don't know if there are any expectations when it is done, but in Ma's case there is a pretty clear progression from academic, note-for-note perfection to free self-expression. The new recording is casual, sometimes quirky, non-judgmental. Some of the steam has been lost since Ma's younger days. He is no longer trying to saturate every note with vibrato or maximize every contrapuntal climax. While the serious classical music world stands firmly by the first recording, I have always been an advocate of the second. I rediscovered Bach and entered classical music as an adult in large part through that record. This new recording seems very much like how Ma might play the Suites by himself, to himself, with no expectations. In many places he seems to be saying something to the effect of, “It can also go this way.” This is not simply Ma playing the Suites one more time into a microphone; these interpretations have changed.